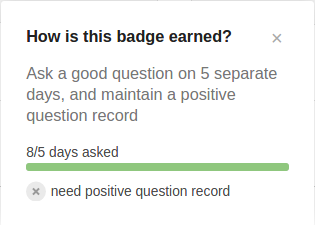 Asking a good question on 5 separate days, and maintaining a positive question record. and the progress bar is also full. Why haven't I received the badge yet? Not the answer you're looking for? Browse other questions tagged discussion badges badge-progress . 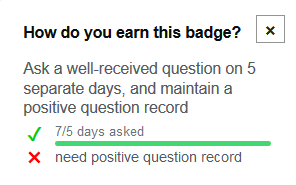 I've met the requirements for my second Socratic badge, but haven't gotten it - why? 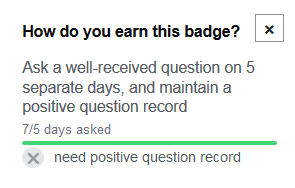 Why is my curious badge not being awarded?